Come vacations and everyone seems to be suddenly bitten by the travel bug. While searching for cheapest, good quality and secure accommodations in your place of travel, one might come across the terms “Service Apartment” and “Budget Hotel”. What is the difference between these two, and which is the best bet? Let’s find out. 1. When compared to budget hotels, service apartments are 60% cheaper as a service apartment can accommodate 3-6 adults per room while a budget hotel can accommodate a maximum of only two. 2. When it comes to flexibility service apartments are more flexible than budget hotels in terms of cancellation of tickets, check-ins , check- outs, Free wifi etc. 3. Service apartments are 60-70% more spacious than budget hotels of the same cost. 4. Service apartments usually provide fully equipped kitchen with self catering facilities which is lacking in budget hotels. 5. Service apartment provide wider discount rates of upto 40% for long stays which are found missing in budget hotels. There is a huge difference in savings especially for groups/families. To conclude, service apartments come with greater flexibility, cheaper rates, self catering facilities and give a homely feel for customers which has resulted in their rising popularity over budget hotels. Make sure to search ahead for service apartment options in your place of travel. A word of caution though – one must be extra careful of fraudsters and take care to avoid pitfalls. So book with care and have a happy stay! 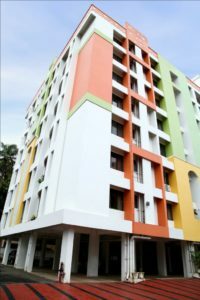 Posted on February 4, 2017 Categories Properties in PantheerankavuTags Buy 3 bhk villas in pantheerankavu, Buy villas in pantheerankavu, house for sale in pantheerankavu, independent villas for sale in pantheerankavu, luxury 3 bhk villas in pantheerankavu, luxury 4 bhk villas in pantheerankavu, luxury villas in pantheerankavu, ongoing villa projects in pantheerankavu, pantheerankavu villa project, residential villas in pantheerankavuLeave a comment on Service Apartments VS Budget Hotels – Which To Choose? ?